Business and marketing strategy for the digital age. I recently moved back to an executive position on the client side from a C-Level role at a leading midsize digital agency. Many aspects of the client side have changed in my five-year hiatus, but the following client-agency pitfalls remain the same. If you’re an agency pitching new business, an AOR, or mid-project, take note of these red flags. 1. Why does your company exist? 2. Do you have experience and success in my business sector? If you can demonstrate both, let’s talk. Show me that you know my target audiences and that your team has a basic understanding of my competitor set. Be sure to have a point of view when you walk in the door. Make it easy for me to sell. Give me a Powerpoint that is easy to understand, based in researched fact, and that I can sell to management. Making me reformat work that we’ve agreed to or that we’re co-developing will simply delay the project. KPIs are not an afterthought. When you show up with the big idea, tell me how we’re going to measure it. It’s okay to have softer goals with social initiatives, but you can’t show up without them. Better yet, show me how our solution drives compound results, e.g., how SEO and social work together to create activation. Demonstrate short-term wins and show a clear time to value. I’m running both sprints and marathon efforts; don’t suggest a strategy with zero short-term wins. If there is a technical or pass-through cost, show me how it will pay off and when. This helps me manage expectations inside my company. Manage our budget. Synch our spending with our timeline and let me know when we’re being inefficient. I can make decisions and staff changes that get us back on track. The worst thing you can do is to tell me when we’re almost out of funds and only 50-percent through the project. Account management changes cause disruption. We both have to reinvest in a shared understanding of goals, history, and ‘the roadmap.’ Assign a senior person to oversee this transition or risk creating an inflection point for a change in the relationship. What if what we’re doing isn’t working? When do we cut our losses, and what’s our Plan B? We should develop alternatives together. No one gets fired for executing on a shared plan. If you want more work, proactively pitch initiatives that are going to provide greater customer insight and generate activation. I’m not holding back a bucket of money; I have to justify greater expenditures, and budget approval can take internal pre-sales and procurement time. The future of retail does not hinge on any one device or technology. The future of retail demands a commitment to the customer experience above all else; technology is simply an enabler for a brand’s contextual and personalized connection to the customer. What is hype? It depends on your desired business outcomes. If your goal is to be seen as a progressive organization whose use of Google Glass personalizes the customer experience – such as Virgin Airlines use of Glass – then Glass is not hype. If iBeacon successfully delivers incentives and streamlines checkout, then iBeacon is not hype. Hype is a condition of unsuccessful implementations. I believe that the future of retail can be found at the intersection of personalization, utility, and stopping power, or engagement; to synch the shopper’s journey with the right technology – tools, data inputs, and measured insights – to enrich the shopper’s experience. Who will clean up the multichannel data mess? Clients are experimenting with new roles such as the Chief Omnichannel Officer, or “COCO” for short. Apparel retailer “Finish Line” installed its first COCO this year. His (in this case) job is not to tie together customer data one API at a time, but to be a strong marketing and digital leader – to be accountable and responsible for the customer experience across the multichannel retail landscape. Where and when is the transition from experimentation to practical implementation? That time is now. What we’re experiencing is the Big Bang of data, technology, design, and customer experience. The question is whether your organization is ready to create a strategic planet for these elements or if you’re going to end up with a lot of hot air. Large clients are creating in house “agencies” as a way to get closer to the customer (and their data). These in-house agencies are also taking over social media responsibilities for the firm and its brands. Business transformation firms like Deloitte are acquiring ad agencies to complement their current services with marketing transformation data and services, e.g., social metrics, analytics, and creative. Mid-sized agencies are combining off-the-shelf measurement applications – or are doubling down on suite proficiency, e.g., Adobe Marketing Suite – to demonstrate greater ROI to their clients. What are you seeing in Adland? Choice is now available locally and globally on and offline for pretty much any good or service a consumer could want. This is both an opportunity and a challenge for brands looking to reach customers across the device universe (mobile, desktop, tablet, gadget, etc.). Marketers have better access to customers, but customers are better informed as they go into purchasing mode. Comparison shopping, product forums, social media, and other information sources have given the consumer the ability to make informed decisions before, as well as at the point of purchase. As a result, brands can no longer solely dictate pricing and product delivery timetables – their customers are playing an active and real-time role. Social media, showroom price matching, and price comparison marketplaces such as eBay and Amazon make it difficult for any brand that’s not dictating MAP (minimized advertised price) to be undersold or commoditized. What does this mean for marketers? It means that brand narrative, data-aided personalization, rich product information, and access to company experts is more critical than ever before. It means that integrated marketing is here to stay. The minute you accept that your brand or product is replaceable is the moment you start working on great things like positioning, merchandising, packaging, product development, measurement, and an integrated marketing approach. This is the time when you start thinking about how to surprise and delight customers and obsessing about how to remove friction from the buying process. This is when the product finds its voice, and you as the marketer find your power. Public relations firms such as FeishmanHillard are moving toward an integrated service offering, but as a senior PR contact posited to me earlier today, will FH’s Omnicom agency partners welcome this new quasi-competitor? Why are single-focus PR, social, mobile, and traditional agencies affected so deeply by the digital r/evolution? The modes and mediums by which we market have changed dramatically in less than five years, e.g., mobile, social, apps, and data influence. Data can now inform (and complicate) a multitude of related independent and interdependent channels. Long gone is the traditional purchase funnel … and long live the analytics and measurement industry. Welcome the new marketing mavens. Call them Math Men and Women, strategists, data scientists, … these are the principles and collectives (agencies or otherwise) that understand how to harness the integrated marketing ecosystem. They ground their recommendations in strategy and planning (an understanding of the customer), manifest them in effective creative, build them with tech, and measure them in analytics. And while traditional PR agencies and large holding companies reconfigure (along with mobile- and social-only shops) to serve this brave new marketing world, agencies that were born digital – that were built for media integration – had better maintain their sprint. Everyone is gunning for the leader, and right now the leaders aren’t the biggest or most specialized agencies; the leaders are scaling to meet the increasing demand for integrated services. Read the article that inspired this post at nytimes.com. Public relations professionals can play a big role in driving and amplifying their clients’ digital marketing efforts. One area of opportunity is search engine optimization (SEO). We all know that customers use search at the beginning of the information gathering and purchasing cycle, so it’s imperative for all brands and businesses to be found in natural (organic) and paid search. Since paid search can be costly for broad, general terms, it’s best to employ best practices to improve your clients’ exposure in organic, unpaid search. Here’s a quick playbook for improving SEO with public relations. Determine the keywords and phrases your clients want to be known for in organic search, e.g., your client’s value proposition, brand or product names, and top three communication pillars or points. Measure where your client ranks for those keywords and phrases. There are a number of web and desktop applications that you can use for rank measurement including Rank Tracker, Bright Edge, and others. You’re looking for search volume (number of searches for these terms), competition (where competitors rank), and your client’s current rank. Create a plan to integrate the highest value and highest opportunity keywords into future communications. Map these words and terms to the most relevant pages on your client’s website. You want to match keywords to pages where high-value information and transactional goals are in place, e.g., a download, a lead capture form, etc. Or, create new landing pages that best serve your clients’ customers. Even if you’re measuring rank for 50-plus keywords, be sure to prioritize 5 – 10 keywords that will send viable leads or sales to your client’s website. This prioritization helps focus efforts across marketing channels and disciplines. Update web page meta data (your page titles, keywords, and descriptions) to include the targeted keywords and phrases. Integrate keywords and phrases into your press releases and boilerplate, again mapping back to relevant pages on your client’s website. Run your links through your measurement package’s link tracking tool, e.g., this is the tool for Google Analytics. Create a process so that all internal stakeholders take these steps across all published materials. Measure natural search referrals and results weekly (or monthly, based on resources), using any additional learnings to fine tune your SEO efforts – carefully reviewing how visitors navigate through your client’s website. For keywords and phrases where there is too much competition and your client cannot rank highly in natural search, consider using paid search and social marketing to boost visibility. This same methodology can be applied to all outgoing content-related efforts, including press releases, website content, white papers, and more. Any digital content that enables links to your client’s websites, microsites, and other digital presences, such as social media, can help reinforce brand messaging and pillars. If there are special targeting considerations such as geography, customer job roles, etc., be sure to incorporate those into your planning. This type of optimization on-site (websites, microsites, social destinations) and in outbound communications ‘tells’ search engines that your client has content authority, thereby improving their search engine rank over time. Be patient however, ranking result improvements take 30 – 90 days to start materializing in organic search results. For all of the talk and work around consumer data integration, the industry is just getting started with the type of data correlation/merging that enables seamless, relevant experiences across the Web. 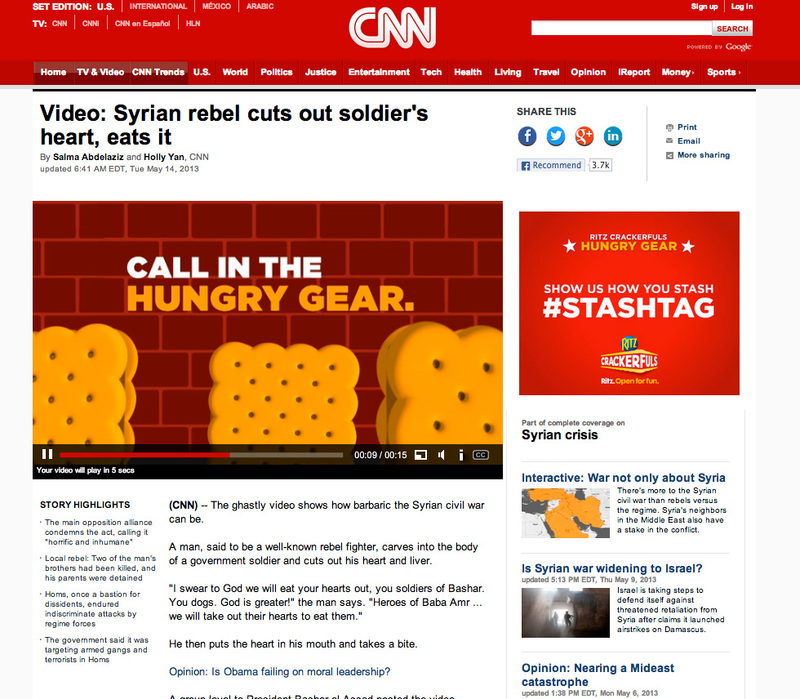 When systems play nice it’s a beautiful thing, e.g., Amazon.com, the promise of Facebook Custom Audience Targeting, etc., but when systems get the wrong instructions (keywords, omission of negative keywords, algorithm weighting) you get this headline with a food ad. I’ll be speaking on a Sacramento Public Relations Association (SPRA) Professional Speakers Series panel about “Defining Your Digital Strategy” on May 23, 2013. Josh Morgan from Edelman will also be on the panel, as will Phil Tretheway of Position Interactive. It should be a great conversation; I hope you’ll join us. Date: May 23, 2013 11:30 a.m. – 1:00 p.m.
More details and the RSVP Eventbrite form is here. Protect the core. Build the mass. Retailers should make amends when customers voice a perceived wrongdoing, however, J.C. Penny’s new ad is a miss – a lost opportunity to draw in new customers. The ad does go to rebuild goodwill among the retailer’s current core audience, but to those unfamiliar with JCP’s newest product assortment, the ad strikes a desperate tone. I’d planned to visit JCP because of Ron Johnson’s once lauded (and now derided) merchandising strategy. News of the new, brighter, more open JCP featuring independent brands that exude curatorial respect – Levi’s, Martha Stewart, Jonathan Adler, and others – got my attention. Now, I’m not so sure. While I applaud J.C. Penney for trying to protect (and win back) their core audience, this misstep might be a case of winning the battle, but losing the war. They’ll save today’s shopper, but lose tomorrow’s; shoppers that embrace experiences and narrative and who will pay a premium (or at least full price) for it. 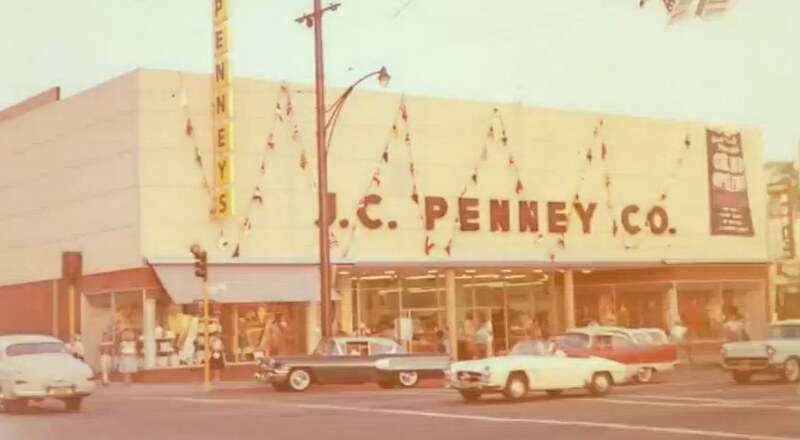 In my opinion, J.C. Penney’s retail reversal is a loss of the “surprise and delight” that propelled Target (Johnson’s former employer) to retail stardom. They’ve exchanged a “new position” for an undifferentiated return to mediocre pricing tactics. J.C. Penney is once again about price – not value – a position shared by many others in an increasingly crowded space. Come back, Ron Johnson. You were just getting started. Operation: Sister’s Turkey Burger. How The Counter Won Us Over.